Continuing my Civil War adventure, I present the Confederate Supply Wagon. 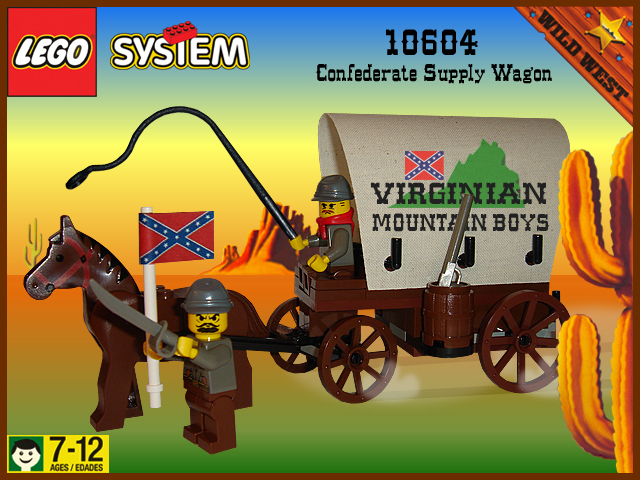 Very neat addition to the Confederate theme TheBrickster! I'm assuming the writing is edited on, but it is done well. I think I like the bigger amount of brown more myself, and the pose of the soldier with the sword is neat too. Your civil war MOCs are very good Brickster. I presume that the MOC, has been inspired by that photo? I love these Brickster, it is about time the Rebels showed up! I can also see improvement in your building style, these al look really close to their originals and this one beats the hell out of the old set TLC made for me. I like it, the brown looks great. It's nice to see some Confederate guys around! I'm assuming the writing is edited on, but it is done well. I always wondered why LEGO didn't at least use brown wheels for their WW wagons. Only one small set had used brown. Great sub-theme, isn't it. If Playmobil designed for younger kids can make Civil War sets, why not LEGO? Good research Penguin. I didn't spot it on the Web until looking for some "official-looking" Confederate wording. After searching, I found the picture you shared. While I don't think it's authentic (I could be wrong), CSA stands for Confederate States of America, and ANV for Army of Northern Virginia - if anyone is curious. Thanks CGH - but this is mainly just a color change of the official LEGO Weapons Wagon, and a slide change to the front by using the brown 1x2 tiles. As I was looking at the official set and pieces, I thought to myself, "what a fantastic little set". LEGO really did a fantastic job with their official WW line-up. It's nice to see some Confederate guys around! I just wish I had more grey torsos to create an army. I'm rather limited on Confederate troops. I like the Civil War stuff. Very Nice! But Im a bit worried that editing with Photoshop is ruining the original model. Thanks Joey, but I consider photo-editing the canvas top just like making a custom decal. I'm a big "traditionalist" myself that doesn't like to use/ruin official parts, but I think the photo editing of the wording simply demonstrates what one could do to create a Civil War sub-theme out of the official line. I could also print a custom decal with the wording and tape it to the canvas if I like the result of the photo-editing (which I have done before). In any case, it's just to capture different looks, this one like the Playmobil wagon. Very nice! I like the classic style it is built in, and it gets 10/10 on the playability scale. Your Confederate theme sets are turning out very nicely, great work! I really like your confederate theme, and this one is also great! That's a totally awesome Western MOC, TheBrickster! It looks absolutely realistic and the choice of using more brown fits esp. for a CS supply wagon very well! 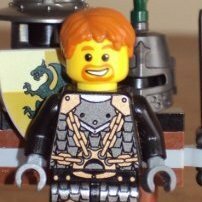 I even like that your MOC does come with two soldiers and not only with one (like in the official set). Yet another great civil war moc. I like all the brown instead of black. Too bad Brickadier General doesn't come around anymore. He'd enjoy this. On the edited wording, shouldn't Virginia be shown with West Virginia still apart of it? Your theme just gets better and better. Great wagon. Personally my favourite of your 'Confederates theme', together with the Confederate Hideout which is awesome too. Love this wagon I do, really great MOC. Be interesting to see all this on a civil war battle field. Really nice job on this Wagon Brickster! I like all the Brown in it. Can't wait to see more MOCs of your Civil War adventure. Wow, I'm glad to see someone else making Civil War mocs, and they are quite nice...very faithful to the mid-90s Wild West style. I don't want to nitpick, but if it were me, I probably wouldn't put the flag pattern on the cars for accuracy. But I know that you're keeping with the "toy look," so it's no biggie. They still look nice. Are you going to go to BrickFair this year by any chance? I plan on bringing the battlefield again and expanding it, so if you want I could make room for your MOCs. I'm already talking with 2 other people who want to collaborate.